Brace yerselves, mates, for it’s the end of an era. For decades the spiced rum market has been dominated by one name – Captain Morgan (The REAL Morgan, by the way, was a poser pirate and a traitor to the cause. Plus he couldn’t sail for damn, so it’s fitting that sooner or later his namesake rum would be sunk.) Well, no longer – Kraken Rum is on the scene, and they stand ready to do some serious damage to their competitor’s market share. Why? Simple – Kraken Rum is the BEST RUM EVER. 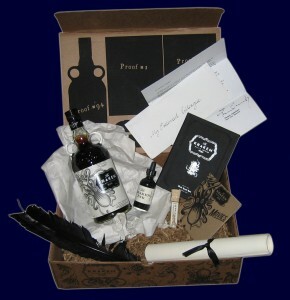 One bottle of Kraken Spiced Rum, one CD full of the Kraken’s tales, a hardbound book of stories, history, and recipes, genuine (likely fake) kraken ink and tooth, a wall chart showing the kraken’s enormous scale – even a personal letter addressed to their “Esteemed Colleague.” That’s right – *I’m* an esteemed colleague of Kraken Rum! I bet next Christmas they’ll even invite me over for dinner. And did I mention it was all in a custom Kraken box, sealed in wax? I mean, seriously, when’s the last time Captain Morgan, or any of those other wannabe spiced rums (I’m looking at you Sailor Jerry and Kilo Kai) ever sent me something this nice? The answer: NEVER. Soon I’ll actually taste the rum. And then write a review. Until then, I remain confident in my statement that Kraken Rum is the best rum I ain’t never tasted. Oh, and don’t forget to check out their website. This entry was posted in Rum and tagged bilgemunky's favorites, kraken rum by Bilgemunky. Bookmark the permalink. I agree that if I could find out how to get some I would get me filthy hands on some. Need to Know how to get it!!!!! I seen the Kraekn once-td, and I inked me pants! Where does one get such wonderous spirit?????? Fecking brilliant! I don’t even drink and I want this. Bad. Let’s review this stuff in Pirates magazine! BTW, Happy New Year, mate! I’m thinking of naming our baby Morgan, I had to take a stand. Bwahaha! Lt. Dan rum is my new favorite! Wasn’t Lt. Dan the legless guy in Forrest Gump? Kraken Rum will be available NATIONWIDE in January. Ask your local liquor store and bartender to order a bottle. The locator on the website will be up and running in February. Aye, that be Dan – a stumpy shrimper. I’m startin’ to worry about the new rum’s name after thinkin’ about poor Lt. Dan…….as in seein’ a repairman’s Kracken…..damn me eyes!!!! Nonetheless, I’ll be orderin’ a bottle o’ink as soon as me seawench springs me out o’ the brig. No Rum Has Legs till it be drank! I will have a go with the Kraken rum as soon as it shows up on my shores! Me and little one enjoyed the Kraken history movies. Hell, release the Kraken, dont know till I try it. I have had Captain Morgan, Sailor Jerry’s. Admiral Nelsons, and Other spiced rum and Kraken is 100 times better! A Dark Carmel molasses flavor puts Morgan to shame! If Morgan had met the Kraken He would have lost more than his Ship! If you have not tried somthing Keep ye Hole shut Matey!!!!!! I have to say I have been a sailor jerry’s rum fan for far too long and lastnight saw this bottle in my local beer ans wine store. Loved the bottle the design the label everything. Was a little scared to try it as I had never heard of it but all I have to say about this rum is WOW!!! It was the best rum I had ever had I work in a liquor store and I will be pushing my company to start distributing it! Try it if you get a chance.